Although coastal northern California waters, and especially Mendocino County, have become a favorite destination for California anglers, one type of fishing is under-represented. That fishing is, of course, pier fishing. 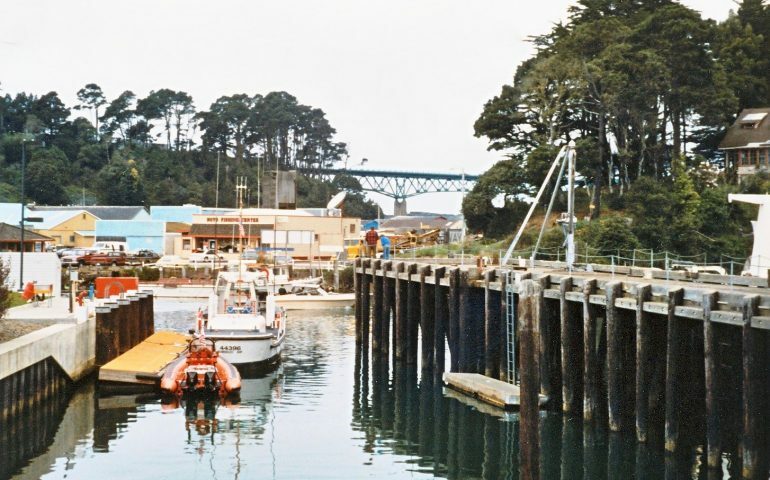 In the more than one hundred and thirty miles that separate Point Arena and Trinidad, there are no oceanfront piers. In fact, in that entire distance, the only saltwater piers are those located in Humboldt Bay. There are however, a few small piers found in the tidal estuaries of coastal streams. Most of these are simply old piers or docks that are used by local anglers for fishing. Several of these decrepit old docks are found in the extraordinarily rich waters of the Albion River. 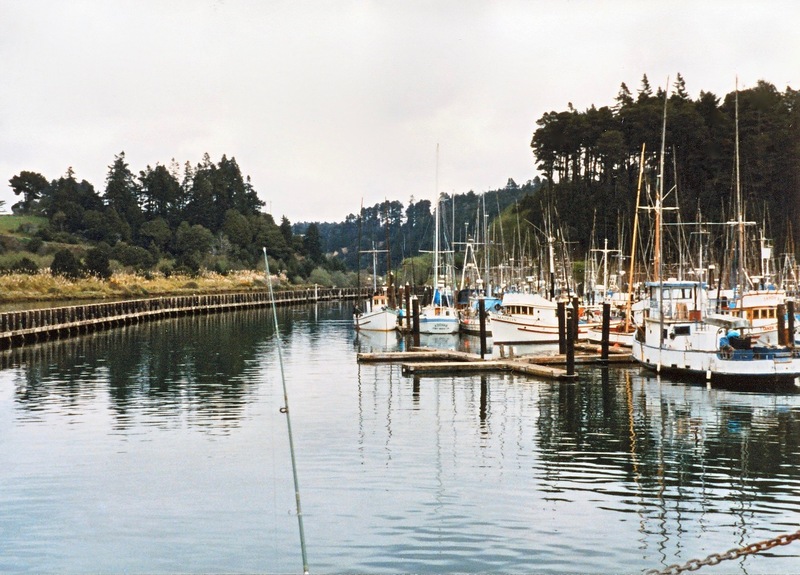 More, and bigger docks (mostly private) are found in Noyo Harbor, the harbor for Fort Bragg. One pier seems to be used as the semi-official fishing pier for interested anglers. Although the pier is fairly small, only 190 feet long and 20 feet wide, it does offer excellent angling at times and it can see heavy use. As an example, when Pacific herring are in the river, space will be at a premium as anglers cast their multi-hook leaders out for the scrappy and tasty fish. When the runs are strong, buckets will be filled with the small fish. Environment. The pier is located near a curve on the Noyo River, just down river from the Noyo Mooring Basin. The water here is shallow, generally less than 10 feet deep, and tends to be brackish with considerable tidal influence. The bottom is primarily mud with little vegetation. The pier was built in 1968 and the pilings themselves have considerable barnacle growth, although no mussels. To the right of the pier is the mooring basin itself, an area of extensive docks, and a long wooden-piling breakwater (all of which should attract fish). Because the water is mainly freshwater, fewer species will be found than at saltier locations. Still, quite a few fish are taken from the pier. During the rainy season, November to March, the primary species taken will be a few small trout or steelhead. Silver salmon (coho salmon) used to be common but now are rarely seen and illegal to catch. Late winter will also see a few starry flounder landed and by the spring, April to May, striped seaperch, rainbow seaperch, pileperch and redtail surfperch will show up in angler’s catches. Summertime yields mostly pesky shinerperch and staghorn sculpin, but a few flounder will continue to wet the appetites of fishermen and a few sand sole will be included in the bags. At times, the schools of shinerperch will be joined by a few of the larger and more prized walleye surfperch and silver surfperch. As mentioned, a prime activity from May to the summer is jigging for herring and this is usually done during the top of the tide, especially an evening tide. Fall into winter can also see schools of small smelt that can be caught with a multi-hook bait rigs. Fishing Tips. Primary angling is one of four types. For the larger perch, a high/low leader, equipped with size 6 or 4 hooks, is used, along with small pieces of shrimp, worms or small crabs (which you can find under rocks along the water’s edge). For the perch, fish right around and under the pier. Flounder and sole are generally caught on a high/low leader fished on the bottom using a piece of anchovy for bait. Better, is to use a sliding, live bait rigging, even if you’re not using live bait. The third method is jigging for herring. Here, an angler typically uses one of the commercial bait rigs (Sabiki/Lucky Lura). These leaders generally have from size 6 to size 12 hooks, and are equipped with anywhere from four to eight hooks. The most common method is to cast as far as you can from the pier, let the leader sink toward the bottom, and then start a rapid, but not overly fast, retrieve with an occasional jerk to the pole. If herring are present the angler will quickly know it. Special Recommendations. This is an area of the river heavily used by boats, both small recreational craft and larger commercial ships. Do remember to keep your line out of the way of the boats. Most boats will not alter their course for your line; they need to stay near the deeper water found in the center of the river. Also, remember that this is considered fresh water and your fishing license must be of the appropriate type. Hours: The pier is open 24 hours a day but has no lights for night fishing. Facilities: None with the exception of restrooms, which are found near the foot of the pier. How To Get There: Take Highway 20 to the South Harbor Dr., turn north and follow the road down to the Noyo Mooring Basin parking lot and the pier. Parking cost $1 a day. Management: City of Fort Bragg.